Enjoy The Happy Pear's clever double-action Chestnut and Sweet Potato Rotolo that works well as a starter or main course. 1. Soak the lasagne sheets in a large bowl of luke warm water, making sure the sheets are totally covered with water. After 10 minutes, check that the sheets aren’t sticking together and gently separate them if needed. 2. Preheat the oven to 180°C/gas mark 4. 3. Put the chestnuts in a food processor and pulse until crumbly. Add the water and blend until smooth and creamy. Set aside. 4. Keeping the skin on the sweet potatoes, dice them into small bite-sized pieces. Put in a medium pot and cover with cold water. Bring to the boil, then reduce the heat and simmer for 10 to 15 minutes, until tender. Drain and set aside. 5. Heat the oil in a large frying pan over a medium-high heat. Add the onion and cook, stirring, for 3 to 4 minutes. Add the mushrooms, garlic and a pinch of salt and pepper and cook for 4 to 5 minutes, until the mushrooms have started to brown and wilt. Add the wine and allow it to reduce completely to cook off­ the alcohol, then add the tamari or soy sauce. Add the chestnut purée and continue to cook, stirring occasionally, for 2 minutes to bring the mixture together. Remove the pan from the heat and set aside to cool. Add the cooked sweet potatoes and the parsley to the mix. 6. Remove the lasagne from the water and lay out lengthways. Spread each sheet with 1 teaspoon of the pesto. Add 2 tablespoons of the chestnut and sweet potato mixture, spreading it evenly over each sheet. Roll up each lasagne sheet. If using large sheets, cut each roll in three. If using regular sheets, cut each one in half. 7. Mix the remaining pesto with the passata and season to taste with salt and pepper. Pour the sauce into a large baking dish. Place the lasagne rolls, cut side up, in the sauce. The tomato sauce should come about three-quarters of the way up the rolls. This will stop the pasta from drying out while cooking. 8. Strip the thyme leaves from their stalks and sprinkle them over the rolls, then scatter the breadcrumbs evenly across the top of the pasta-filled dish. 9. Bake in the oven for 20 to 30 minutes, until the breadcrumbs are nice and golden brown and the pasta is soft and cooked through. Remove the dish from the oven and let it stand at room temperature for a few minutes before serving. 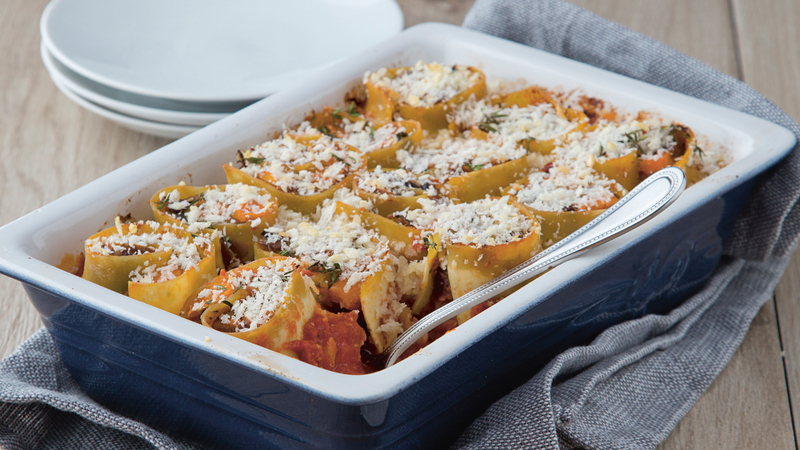 Rotolo is not very well known outside of Italy, but it’s a magni­ficent dish of ­ filled and rolled lasagne sheets baked in a rich tomato sauce. The chestnuts here add a lovely wintry, Christmas feel and give this dish a meaty bite.